One thing that I’ve come to realize about myself in the past 28 days is that I am nowhere close to being the person that I thought I was or the person that I want to be. I feel like I’m always looking at ways to improve as a wife, mother, homemaker, educator, and so on. It’s not easy for me to admit that I’m not living up to my true potential. The last thing anyone wants to be labeled is a failure. It’s even worse when you are attaching that label to yourself. It’s a very unsettling feeling when you realize that you aren’t the person that you want to be. Don’t get me wrong, I still feel that I’m a basically “good” person. But I also feel that I’m not being the best version of me. See, the “best” version of me does a MUCH better job of eating healthy meals on a daily basis, works out 3-5 days a week, rises before her husband and children every morning to prepare a delicious breakfast while starting the laundry and cleaning the kitchen, has no problem whatsoever finding the time and energy to shower every day, and never ever leaves the house without first putting on makeup…you know, just in case. I can tell you one thing. I rarely eat fresh fruit on a WEEKLY basis, let alone daily. I can’t remember the last time I honestly worked out. Most days my kids wake me up because I’ve once again stayed up way to late the night before. There are (unfortunately) days that a shower is just not in the cards for me. And no one that really knows me would think it abnormal to see me walking through Wal-Mart in sweats, a ponytail, and no makeup. It is what it is. So, what is it that I’m not doing right? 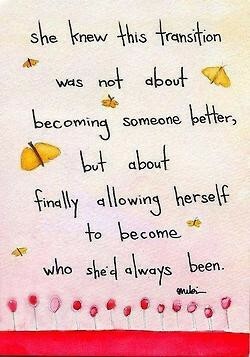 What is holding me back from being the person that I truly desire to be?? I’ve decided that it’s time for me to be more intentional about delving into this area of my life and looking for the answers. What that means for my future, I’m not exactly sure. But I know that I’m not content with the person that I am today. So, I think it’s time for reflection and change. Do you ever feel like there’s just something missing in your life or that you’re just simply not living up to your own expectations? What do you do to get “out of the rut”? ?